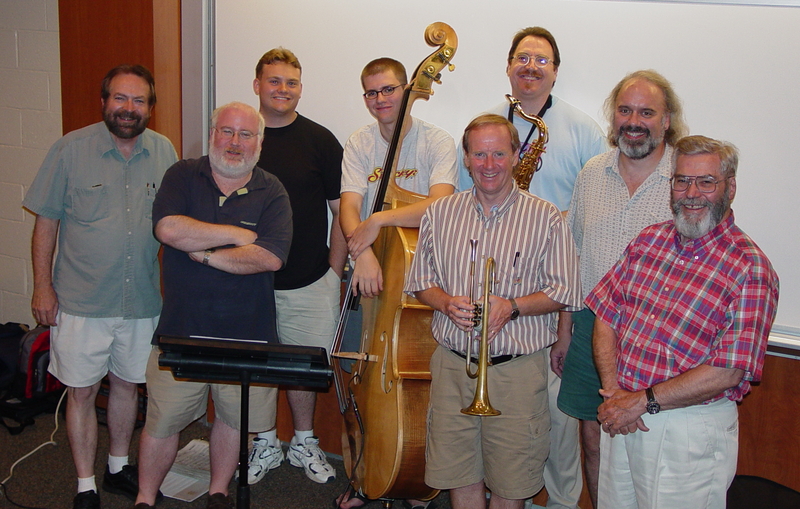 Fire City Jazz Band: Photos!! Click here for more photos of this gig. (For more pics of this gig, click here! Click here for a description of the Habitat for Humanity fund-raiser on February 19th, 2005, from the Frederick County Habitales (newsletter). It includes this picture. the Campano-Radio wedding, November 13, 2004! Earth Day Celebration 2003 on Saturday at the Adams County Agricultural and resource Center included a lot of fun and entertainment. [...]among those providing entertainment at the celebration was Fire City Jazz Band from Emmitsburg, Md. Shown are, from left, Bob Keefer on keyboard; Byron Stay on Flugelhorn; Tim Wolfe, Jr. on bass; Bill Meredith on guitar; and Tim Wolfe on sax. Bob, [a fill-in for] Luke, Tim Jr., Byron, Bill, Tim, and Andy, playing for the Dedication of the new Patriot Center at Mount St. Mary's College. Tim Jr. at a summer rehearsal.